Jacobs Engineering announced it has agreed to sell its Energy, Chemicals, and Resources business to WorleyParsons for $US3.3 billion. The transaction pays Jacobs shareholders $US2.6 billion cash and $US700 million of WorleyParsons shares. 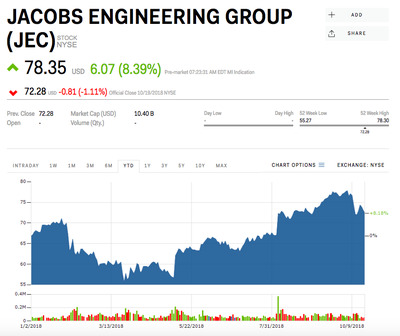 Jacobs Engineering shares rallied more than 8% on the news. 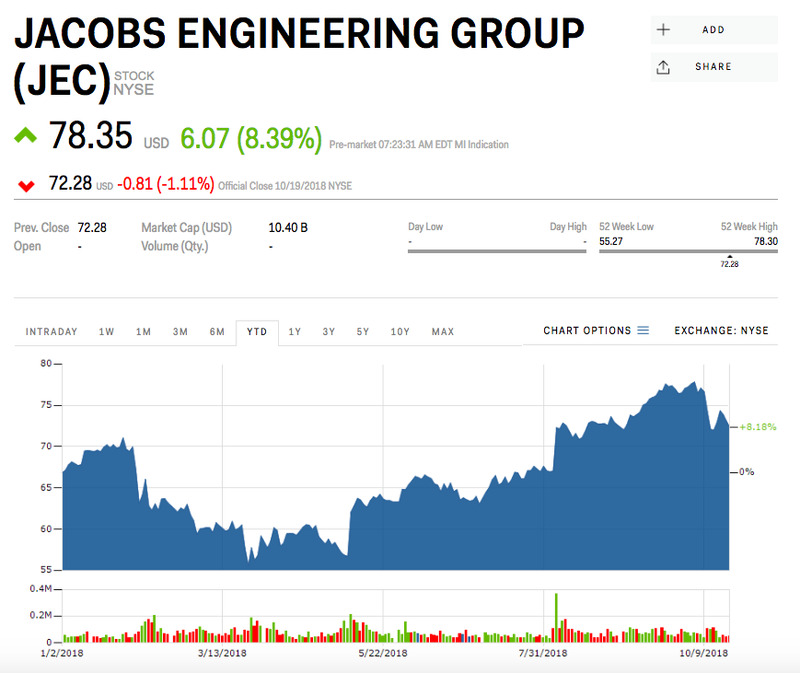 Jacobs Engineering announced Monday it has agreed to sell its Energy, Chemicals and Resources (ECR) segment to the Australia-based WorleyParsons for $US3.3 billion. Shares are up 8% following the news. 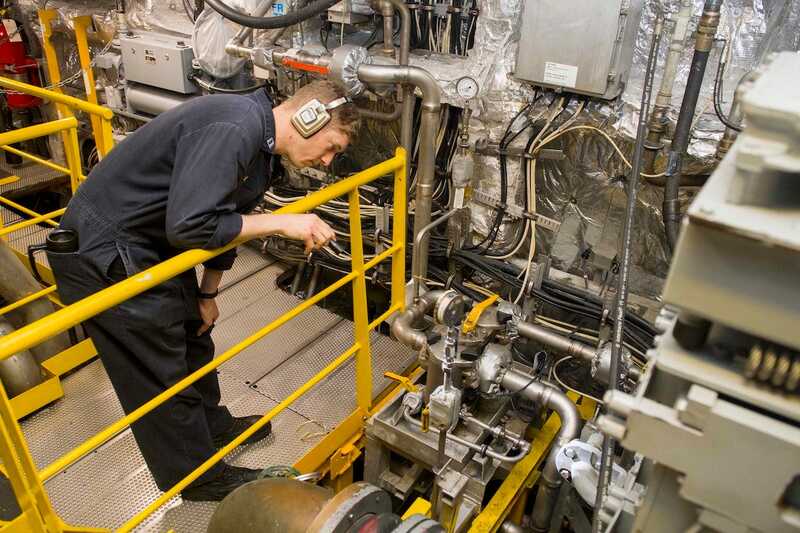 Jacobs said it has entered into a definitive agreement to transfer its ECR business to its engineering-services provider WorleyParsons via $US2.6 billion in cash and $US700 million in WorleyParsons ordinary shares. After the transaction, Jacobs will be focused solely on its two better performing business – Aerospace, Technology, Environmental & Nuclear (ATEN) and Buildings, Infrastructure & Advanced Facilities (BIAF). “For Jacobs, this transaction marks an inflection point in our portfolio transformation focused on more consistent, higher-margin growth as a leader solving the world’s critical challenges,” Jacobs CEO Steve Demetriou said in a press release. Demetriou added that the deal won’t affect Jacob’s adjusted earnings-per-share guidance for fiscal 2019, which is between $US5.00 and $US5.40 according to its quarterly filing posted on August 6. Jacobs is set to report its fiscal year 2018 results on November 20. Its shares have gained 8% this year through Friday.